Here you will find very wide range of OREGON chainsaw chains. You can choose chain for your Stihl, Husqvarna, Partner, Makita, Bosch, Stiga, Echo, McCulloch, MTD, Hitachi, Festool, Black & Decker or other manufacturer chainsaw. Special filtering system will help you to find correct chain easily and quickly. number of drive links*** in psc..
* Chainsaw chain pitch – distance between centers of holes made in two chain drive links, devided by two. 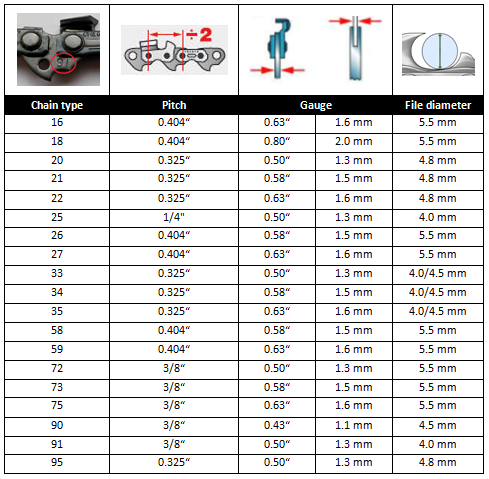 ** Chainsaw chain gauge – width of saw bar groove, or thickness of chain drive link’s lower part. *** Chainsaw chain drive links – chain segments, which slides in chainsaw cutting bar’s groove. Round sharpening file diameter depends on chain type (tooth height).